The lily comes in many shapes, colors and sizes, and is found across the world. The flower offers a sophisticated, graceful aspect to the garden. Some flowers that are thought of as lilies, such as daylilies, water lilies and arum lilies are actually from other groups of flowers, and are not lilies. True lilies grow from bulbs or corms, which store the plant's food and moisture during the dry or cold seasons. Some of the most common summer blooming lilies are categorized as Asiatic or oriental lilies. The 'Iowa Rose' is a bright pink Asiatic lily cultivar that has made the North American Lily Society's top 10 in its annual popularity poll every year since 2005. It has a tint of yellow-orange at the inside of the petals, which are speckled in black. It grows from 3 to 4 feet in height, during early to mid summer. It prefers a sunny location. It will grow best in U.S. Department of Agriculture Plant Hardiness Zones 2 through 7. The blooms will last longer and be more abundant if you deadhead the flowers (remove dead flowers). The bright crimson hue, of the oriental 'Star Gazer' lily, is speckled with purple spots. Other varieties come in pink and white. It grows to about 3 feet, but can reach up to 6 feet on occasion. This lily is used quite often by florists, because of its appearance and scent. The 'Star Gazer' lily grows will in containers, as long as they are in a sunny location. They add a touch of elegance to decks, patios and porches. This lily grows best in hardiness zones 3 through 8. The ‘Casa Blanca’ is an Oriental hybrid lily, that has been bred to create huge pure white petals that are up to 10 inches wide. This mid-summer blooming lily can grow to a height of 4 feet. It is a sun lover, but will do fine in a partially shaded location of your garden. Many bulbs do not need moisture during the winter months. This is not so with this lily. The soil should be kept moist throughout the year. Plant these lilies where you can enjoy their scent. The ‘Casa Blanca’ lily grows best in zones 5 through 8. 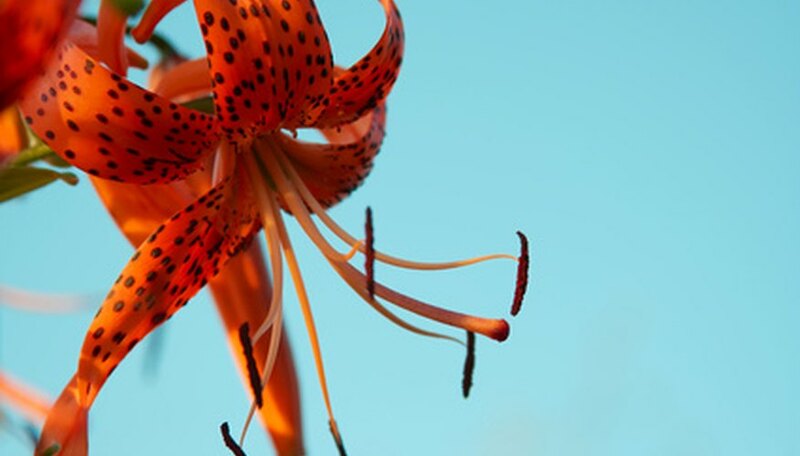 One of the most common and popular lilies is the tiger lily. The huge orange, spotted blooms can grow to be 3 inches across. An edible flower, it can be used to make a spectacular presentation on wedding cakes. There is a common variety that is referred to as a wildflower, grown by tubers (also edible) and the Oriental tiger lily, grown from bulbs. Although common, this lily is known by many names across the country, leopard lily, devil lily, western wood lily, Oregon lily and Columbia lily, to name a few. Tiger lilies grow best in planting zones 2 through 7.